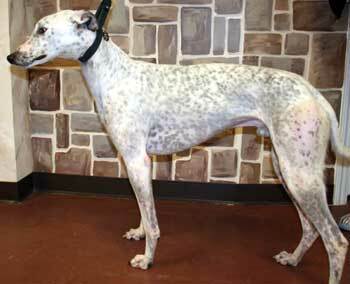 Bonkers, aka About Bonkers, is a dashing almost 2-year-old white and black-ticked greyhound, born March 15, 2005. His sire is the Irish-bred Larking About and his dam is Winks Willow, making his grandsire Molotov. 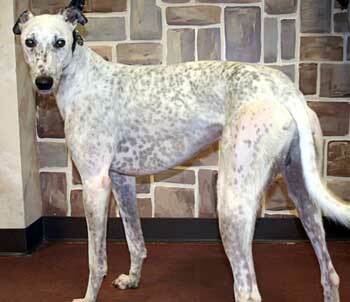 Bonkers decided the racing life was not for him after his one and only race at Valley Race Park in Harlingen on November 26, 2006. So, here he is, searching for his forever home...and unlike his name, he is not really bonkers! We believe that Bonkers will be cat trainable with supervision. Being a very young boy and just off the track he has a lot of new things happening in his life – cats being one of them. He was very interested in "all things house," especially a rawhide, squirrels in the yard, toys, and the other dogs. After he has a little more time to adjust to home life, he will probably be tested with cats again. He has not been exposed to small dogs yet.